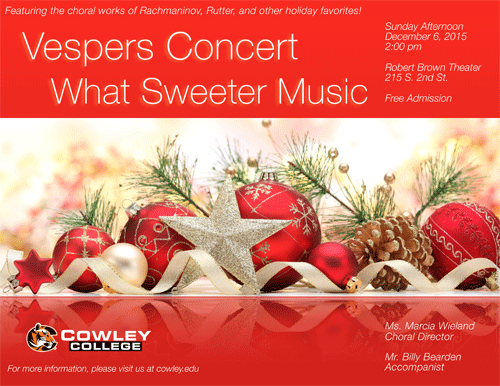 Performing traditional Christmas carols that people treasure this time of year as well as the choral works of Rachmaninov and Rutter, the Cowley College Concert Choir is preparing for its annual Christmas Vespers Concert on Sunday, Dec. 6 at 2 p.m. The Concert Choir and members of the CC Singers will take the stage under the direction of Marcia Wieland. Mr. Billy Beardon will serve as an accompanist. The singers will perform a wide variety of music from familiar melodies like Carol of the Bells and O Come O Come Emmanuel to beautiful, sacred settings of Rachmaninov’s “Bogoroditse Devo (Ave Maria)” and John Rutter’s “What Sweeter Music”. There will be many featured ensembles, singers, and soloists for this holiday event. Following the concert a reception sponsored by the Cowley College Foundation will take place in the Earle N. Wright Community Room. A special performance by the Cowley College Jazz Combo will take place during the reception. There is no charge to attend the concert. Members of the Concert Choir are: Rebecca Dewberry, Emily Lawson, Paige Lundin, Felicia Wheeler, and Keah Benck, Molly McCune, Kendra Doesken, Ashley Daniels, Julianna Soto, Kayla Powell, Whitney Ossola, Courtney Wallace, Hannah Coryea, Mairi Baker, Rachel Burroughs, Brandy Robertson, Charity Smith, Riley Payé, Erin Kennedy, Malori Clark, Daylen Holmes, Alyssa Syers, Mary Wellman, Monica Morris, Lizzie Wille, Alexandria Lawrence, Haley Golightley, Jon Claybaugh, Anthony Falletti, Caleb Bettles, Clay White, Kaden Boatman, Semaj Smith, Logan Brewer, Michael Rodriguez, Kyle Smith, Austin Sherman, Joey White, Ian Smith, Zachary Heyer, Thomas Hecker, Joshua Waldorf, Austin Crowe, and Scott Garrison. Members of the CC Singers are: Emily Lawson, Paige Lundin, Keah Benck, Molly McCune, Lizzie Wille, Charity Schmidt, Riley Payé, Kat Pierce, Jon Claybaugh, Caleb Bettles, Anthony Falletti, Austin Sherman, Michael Rodriguez, Joey White, Zach Heyer, and Austin Crowe.